Four players have been linked with a move to Real Madrid as Florentino Perez has reportedly promised Zinedine Zidane a £300 million transfer overhaul when he re-appointed him as manager of the club on Monday. Rumours of Zidane's return to the Blancos were confirmed on Monday as Santiago Solari was sacked from his managerial position at the club following the disaster of a week he had. A club statement confirmed the appointment saying (via Sky Sports), "The board of directors of Real Madrid, meeting today, Monday, March 11, 2019, has decided to terminate the contract that linked Santiago Solari with the club as coach of the first team." "Real Madrid appreciates the work done by Santiago Solari and the commitment and loyalty he has always shown to what is his home." Real Madrid saw themselves crashing out of almost every competition in the last week: a semi-final loss to Barcelona eliminated them from the Copa del Rey while a failure at maintaining their first-leg lead over Ajax in the Round of 16 fixture saw them exiting the Champions League. In between the two collapses, the club once again lost to Barcelona, this time in La Liga, to throw away their hopes at winning the league title out the window. The Independent UK reports that Perez has now decided to let Zidane take over an expensive reshuffle in the squad for the first time since 2014. The club president has apparently set aside £300 million for the Frenchman to sign players of his choosing this summer. 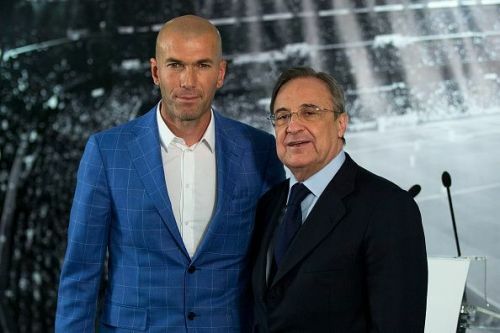 The report claims that the issue was one of the key subjects discussed between Zidane and Perez, with the latter having realised the importance of such a change. Paris Saint-Germain duo Neymar Jr and Kylian Mbappe, Chelsea forward Eden Hazard and Tottenham Hotspur star Christian Eriksen are all reported to be on the list of Real Madrid's summer targets. Considering the fact that Zidane's departure last summer was partly due to the lack of autonomy given to him when it came to signings, it is likely that Perez may have learnt his lesson and is looking for a re-do with the Frenchman.